The writing workshop was followed up the next day by a reading of Ahmed Masoud’s dark comedy ‘The Shroud Maker’ which charted the journey of a woman’s story of survival through modern history. This compelling satirical play was directed by Richard Beecham and performed by internationally renowned actress Kathryn Hunter whose portrayal of 80 year old Hajja Souad living on the besieged Gaza strip, was deeply moving. The play delved deeply into the intimate life of ordinary Palestinians weaving a path through Palestine’s turbulent past and present. The staged reading successfully sold out with many being added to a waiting list. It drew in an extremely diverse audience of around 90 people, many of who were from a Black Asian & Minority ethnic background. Activists supporting the Palestinian cause were interested to see how politics and the arts are intrinsically connected. Many in the audience felt a sense of solidarity and a need to offer support since the event highlighted bringing minority voices to the forefront. Some who attended were artists curious to see new work. Overall the subject matter though universal, also explored the nuances of ‘ordinary people living in extraordinary circumstance’. The added bonus of the talented and well-known actor Kathryn Hunter also drew in a wider audience. 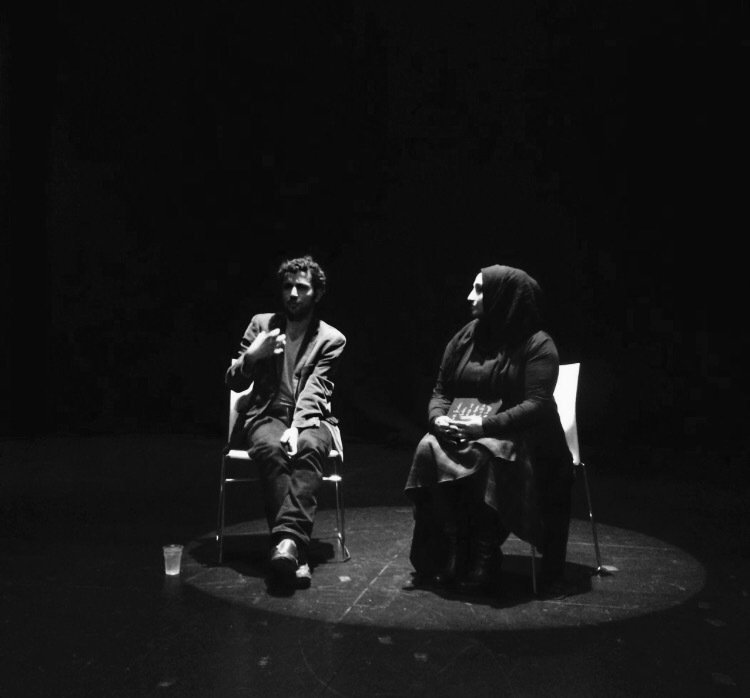 Inclusive and diverse audience engagement is vital to us at Outside The Frame Arts as often we have found through our engagement with the arts that theatre is inaccessible to many marginalised and underrepresented communities – largely being an arena consisting of and catering for the white middle class. This event represented how a real investment for change – a conscious step away from the status quo, can reshape and redefine the demographics of audience development, create a better understanding between people who would not normally engage with each other and enhance community spirit on a local and global level. It also encourages well-known establishments to reevaluate their outreach work and be open to welcoming diverse artists as skilled and talented contributors with distinct experience and knowledge, into the structures that make up the arts world. The event closed with a Q&A session with Ahmed Masoud hosted by co-director of Outside The Frame Arts, Hafsah Aneela Bashir, opening up space for the audience to have an engaging and in-depth discussion with Ahmed spanning comedy, literature, his childhood, representation and moral responsibility through the arts. Ahmed Masoud was extremely generous and warm, discussing the complexities of his experience as a Palestinian writer and the challenges he has faced with his work. He explained how he was unable to go to Palestine to attend a well-known literature festival he had been invited to speak at, yet his British friends crossed the border easily. As a Palestinian man, we learnt that the restriction on his freedom and basic human rights informs how and why he chooses to write. He emphasised that for him, it was imperative to write. In this vein, as a writer fighting for survival, there is no choice but to put pen to paper. He garnered a positive response from the audience many of whom stated they wanted to learn more about the region, its culture and the rich canon of arts it has to offer. ‘It was a great experience. The play was very heart-touching. Hunter was brilliant. Thanks for organizing and bringing Palestine spirit to Manchester’.